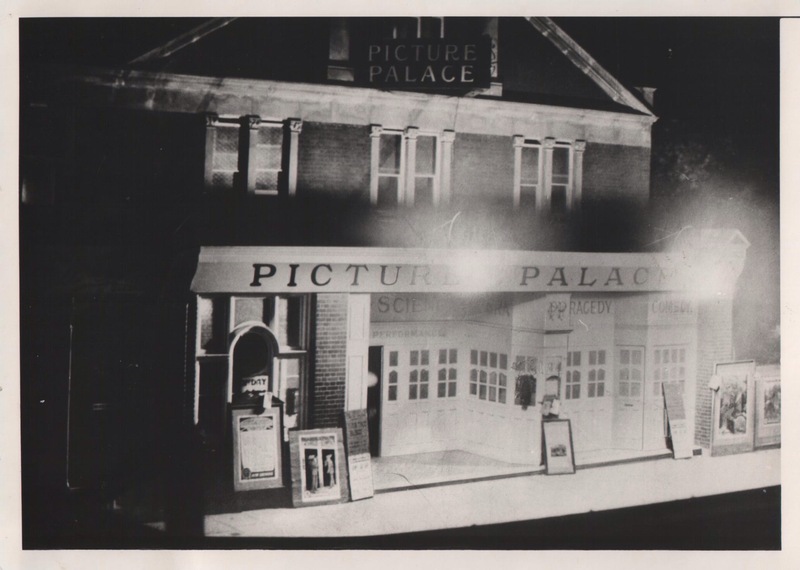 Lee Picture Palace was a short-lived cinema on the corner of Bankwell and Lee High Roads. It only showed films for seven years, but the building lived on for nearly 90 years in various guises. This post tells the story of the cinema, its builder and what happened after the safety curtain came down for the last time. 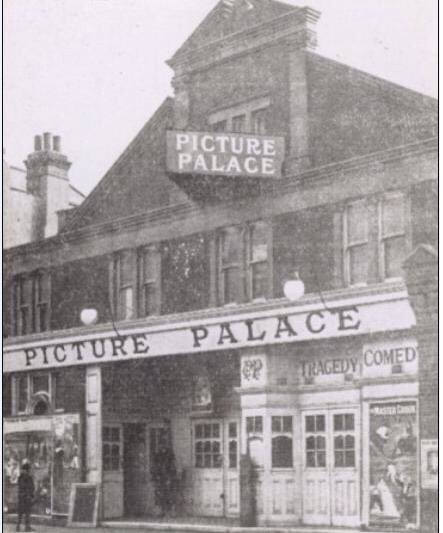 The Lee Picture Palace opened on 26th April 1910 on the corner of Bankwell Road, which had been built a few years earlier. It ought to have been successful as at that stage there was no local competition – the Imperial Picture Palace at Lee Green and The Globe at Hither Green wouldn’t open until 1913. In Lewisham, there was just the Electric Palace, which was replaced by the Prince of Wales in 1922 (1). Its owner, operator and presumably builder was James Watt, initially he didn’t have a Cinematograph licence to operate and was fined, getting the licence a month later. Watt was a major builder of homes in the Catford area too – there is another post on him which focuses on this, as well as on his family’s history. It had a capacity of 552 and there were both stalls and a small circle. There is some confusion as to the architect, the London Film Project, implies it was Norfolk & Prior who were also locally responsible for the Park Cinema on Hither Green Lane (Carpet Corner as of February 2018 but with plans to turn into flats) the Electric Picture Palace on Sangley Road and what finally became the ABC in Catford. However, Cinema Treasures, suggests that it was the renowned cinema and theatre architect E. A. (Edward Albert) Stone who designed it. Stone was responsible for a large number of major projects including the Astoria in Charing Cross Road, which after it finished as a cinema became my favourite medium-sized music venue, but was sadly demolished as part of the Cross Rail development; what is now called the O2 Academy Brixton; what became the Rainbow Theatre in Finsbury Park and the Prince Edward Theatre in the West End. 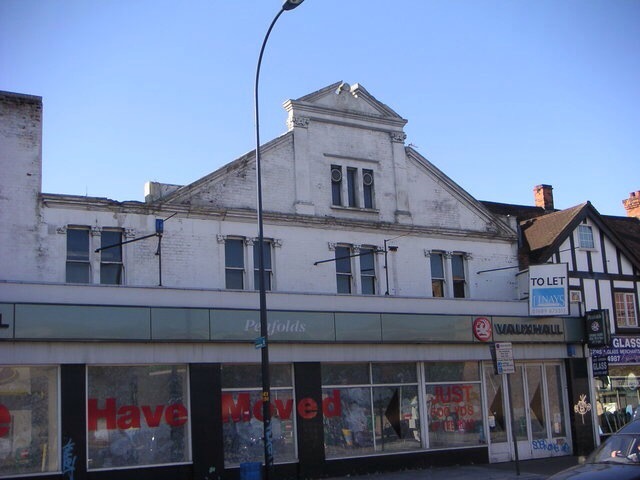 It seems more likely that both were involved though, Ken George suggests that Norfolk and Prior were a local firm of estate agents (2) and the same combination was certainly used at what became the ABC in Catford. It seems that in June 1910, once the licensing issues were resolved, that patrons had the added attraction of bagpipe music welcoming them to the theatre (3) – reflecting the owner’s Scottish heritage . There was footage of the renowned local professional marathon runner Charlie Gardiner – covered in Running Past in 2015 – in a race in the West Midlands later that summer (4). Sadly,this footage seems to have been lost. Little is known about the other films shown at the cinema – although pre-opening publicity suggested “Motoring Pictures”– a silent incarnation of Top Gear perhaps? Although, this might be a typesetting error and be the more mundane “moving pictures”. In 1911 it may have shown British films like A Touch of Nature and A Burglar for One Night, and it would have almost certainly shown some British Pathé News reels such as for the coronation of George V.
While only educated guesses are possible about the films that played to the audiences at the cinema, there would not have been any Sunday showings – Watt was a devout Baptist would not let his cinemas open on a Sunday. It is known that various sound systems were tried at the cinema including Vivaphone which attempted to synchronise sound and picture. As well as being a fairly large scale builder, James Watt was a pioneer of popular entertainment in the area – Lee Picture Palace was one of many cinemas he owned. He opened his first cinema in 1909 – the Electric in Catford (now retirement flats on Sangley Road), but went onto own around 25 cinemas and ice rinks over the years – mainly in south London, but extending as far as Tottenham, Belvedere and Wandsworth. It was re-named Central Hall Picture Palace on 10th January 1916, a brand used by James Watt across several cinemas. It was requisitioned by the Ministry of Munitions on 5th May 1917 and was converted into a munitions factory. While it was still listed as Central Hall Picture Palace in Kelly’s Directories until after the war, it seems never to have re-opened as a cinema. The former cinema was to become home to the Phoenix Garage, run by Messrs Nightingale. Bower & Booth in 1923 but by 1930 the ground floor seems to have been being used by Credit Drapers, James Brothers and the printers Dickson and Scudamore (who were part of the family of the local builders W J Scudamore, George was the son of Cornelius who was the firm’s architect) with the Lee Social Club upstairs – however, the numbering is a little confusing the Kelly’s Directories of the era. 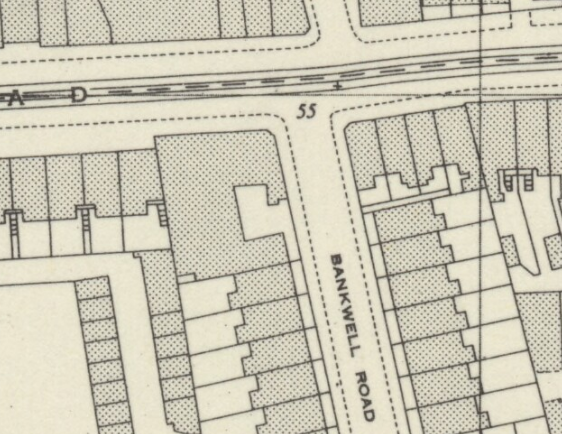 The Ordnance Survey map from 1950 shows several buildings on the site. By the mid-1930s Wittals had moved in and they were to stay there in a number of different guises for around 50 years. They were variously described as a ‘garage’ and a ‘commercial vehicle showroom.’ There is a rapidly fading Wittals ‘ghost sign’ for this on the opposite side of Bankwell Road which was covered in an earlier post. Wittals were still there in the 1982 Kelly’s Directory but by the following year it had become home to the rather grand sounding ‘Land Carriage Company’ who sold caravans; the mobile holiday homes were only there for a couple of years. The former cinema seems to have been empty for a couple of years until Penfold’s moved their Vauxhall sales operation from the current Sainsbury’s site around 1987. The photograph below (on a creative commons Ken Roe) was taken soon after Penfold’s re-located back to Lee Green, almost opposite their original site. 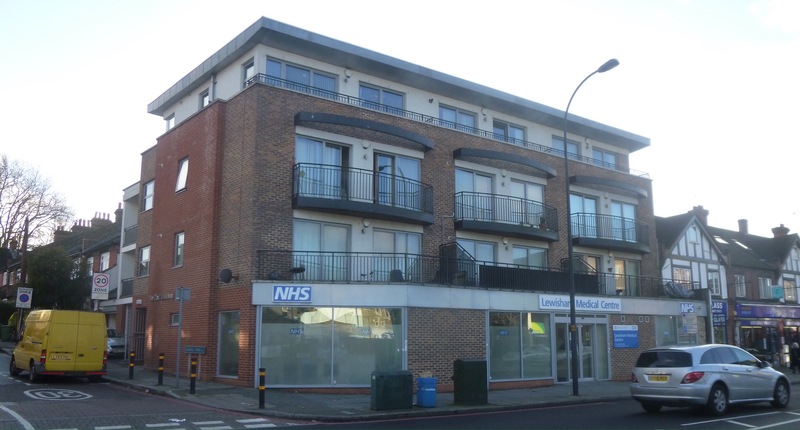 The building was demolished in 2008, and a medical centre with flats above was built on the site – the Zinc Building. In its latter years at least there was a snooker club above the showroom, amongst its regulars, before it closed down in the early 2000s, was Ian Woodley, who was the first winner of a £1m game show prize on British TV on Chris Evans’ TFI Friday. This entry was posted in Lewisham History and tagged Central Hall Picture Palace, E A Stone, James Watt Catford builder, Lee Picture Palace on February 3, 2015 by Paul B. Really interesting read – and I think I may end up spending quite a lot of time on the London Film Project site, may inspire a post or two of my own – thanks! Thanks – it is a really fascinating site – I spent far too long clicking links on it! I’ve found myself working my way through the Kinematograph Year Books that all seem free to download, a great way to lose a few hours I suspect! The place was called Sala X, the building was designed by the same architect who designed Plaza de Espana. I wonder what they are gonna build there now, such a shame. Place was a but rundown, closed for the longest time, long before I moved here. But still was well known among local, used a meeting point. everybody knew where Sala X was. Here you can see pics of the building and an article, but it’s in Spanish. E. A .Stone was a partner in “Norfolk and Prior”, Stone didn’t officially break his ties with the firm until June 1938. Thanks – that’s really interesting. I was planning to update the post at some stage as I have subsequently found a few bits of ‘new’ information on it. Thanks for visiting.